Who are The Aloha Boys? Born and raised in Hawai'i and transplanted to the Washington D.C. area to pursue careers, The Aloha Boys, Glen Hirabayashi, Isaac Ho'opi'i and Irv Queja - met in 1996 while playing music for their children at Halau O 'Aulani, a school of Hawai'ian culture, in the Washington, D.C. area. A special and exciting bond grew musically among The Aloha Boys, who love to kanikapila or play an acoustic down-home, backyard-style Hawai'ian music, a style which includes everything from the very traditional to contemporary songs and styles. They all sing lead and backing vocals. Their voices blend in a nahenahe (soft pleasant) style. They have performed at numerous functions from backyard parties to concerts and at many venues including Carnegie Hall and on the National Mall at the openings of the World War II Memorial and the Smithsonian National Museum of the American Indian, the Kennedy Center Millenium Stage, the Barns at Wolf Trap, and in Rheims, France, Toronto, Canada, New York City, Boston, Philadelphia, Baltimore, Charlotte, Southern California and Hawai'i. In Hawai'i, their peformances include Pakele Live, the Gabby Festival, Slack Key Guitar Festival O'ahu Style, and Slack Key Guitar Festival, Virginia Style, and National Public Radio Talk of the Nation. The music of The Aloha Boys brings them and their audience back to a lifestyle that is unique and precious to Hawai'i. Issac was raised in “WAIANAE” on the island of O'ahu. He is one of nine children, including a twin brother, Ivan. He graduated from Waianae High School and then joined the United States Army. He moved to the Washington D.C. area and currently is employed with the Federal Government. Isaac received the love of music from his father who only played Ki’ho’alu (Hawaiian Slack Key). The guitar is one of his favorite instruments but he can also play the ukulele and bass. He truly enjoys playing music with his close friends, Glen Hirabayashi and Irvin Queja. Gigi, Isaac's wife, is the booking agent for the Aloha Boys. Isaac and Gigi have two daughters, Bess Nanipua and Emily Kukana, both of whom have danced for Aloha Boys' performances, a son, Jeffrey, who is a recording engineer, sound tech and engineering student, and four beautiful grandsons Noa, Charlie, Benji, and his namesake, Isaac. Photo by Colleen Ricci. 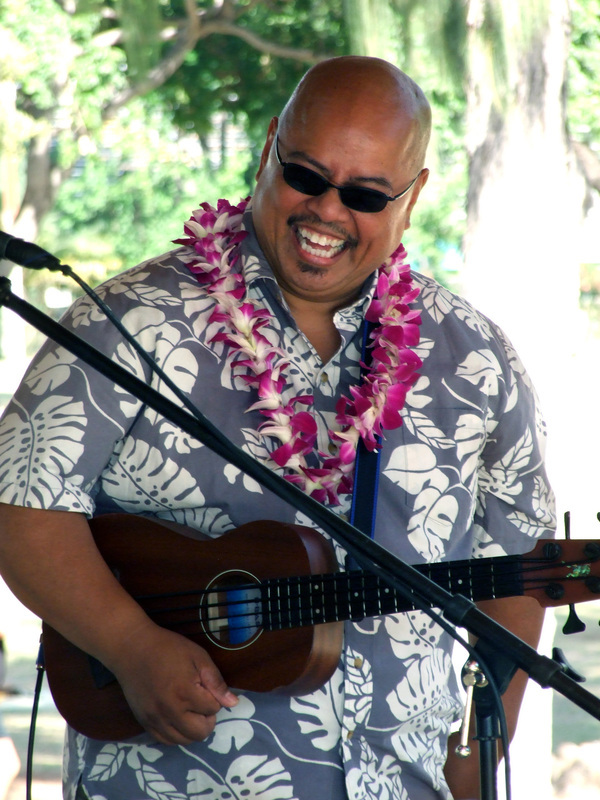 On vocals, guitar, and bass guitar, Irv was born in Wahiawa, O’ahu, graduated from Damien Memorial High School in Honolulu and earned his Bachelor’s Degree in Communications at the University of Hawai’i at Manoa. While in Hawai’i, Irv’s initial interest was in rock and roll and Top 40 music, playing the drums in several local bands. Later Irv’s interest expanded to include jazz, and it was not until his move to the Washington, D.C. area in 1979 that he began appreciating and playing Hawaiian music. Irv moved to this area to work for Hawai’i’s junior senator, Spark Matsunaga, and remained with him until 1990. Irv continued his employment in the US Senate from which he retired in 2011. His wife Shirley is also from Wahiawa. Haunani, their youngest daughter, is a graduate of the University of Hawai'i, a flight attendant for United Airlines, and a hula dancer with Hula Halau Ka Pa Hula o ka Lei Lehua. Noelani, their oldest daughter, is a graduate of the University of Maryland and dances with Halau O 'Aulani. Photo by Colleen Ricci. Uncle Glen was born a long time ago on O'ahu. His family lived in Lanikai at first, but moved to a tiny house with a huge yard on the beach in Kailua with 100 coconut trees lining the driveway. He then moved to Kaua'i when he was in the second grade. He lived in Kilauea, Kaumakani, Kekaha, and Waimea on Kaua'i and spent a lot of time in a family cabin in Koke'e. His first musical instrument was the ukulele. 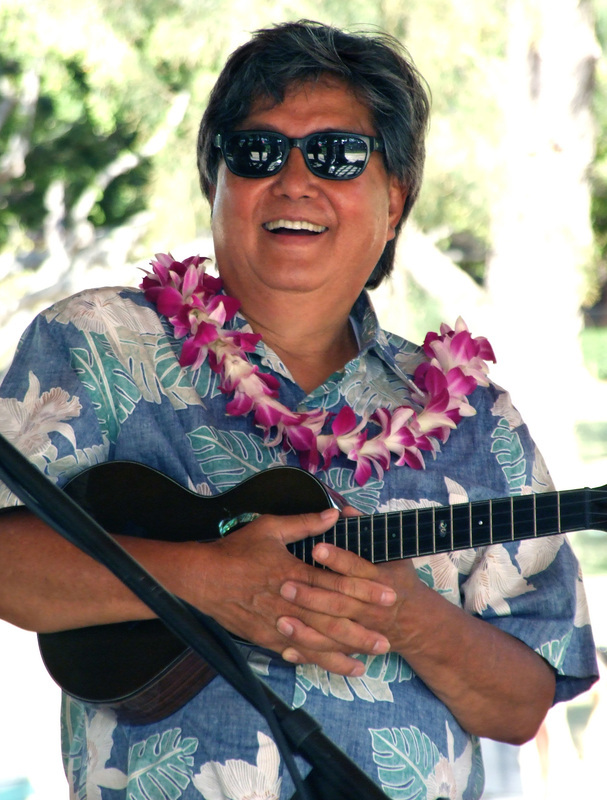 Charlie Kaneyama used to come to the elementary schools on the west side of Kaua'i after school to teach ukulele. He remembers listening to the kanikapila sessions under the hau tree near Poipu Beach on Sundays. Glen sang in public for the first time with the West Point Glee Club which took him to perform on The Ed Sullivan Show, at Hollywood Bowl, and many exotic venues. 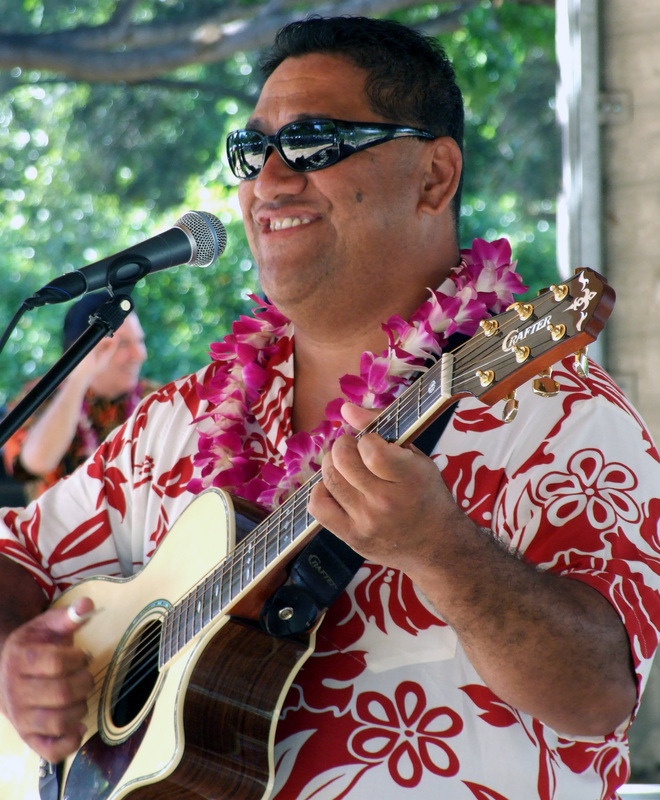 He didn't play much Hawai'ian music until he arrived on the East Coast the second time. He then really started playing a lot when his kids starting dancing hula with Halau O 'Aulani. That's where the Aloha Boys were born. Glen has been in the Washington, D.C.area (this time) since 1986. His wife, Donna, and two daughters, Ashley Hokunani Spaulding and Amy Melenani Kroeller and their husbands, support his Aloha Boys habit. Ashley is a graduate of Virginia Tech and resident of Dallas, Texas. Amy, a resident of Fort Myers, Florida, is also a graduate of Virginia Tech and has traveled the world with The World Race. Hokunani and Melenani dance the hula for The Aloha Boys performances whenever possible. With mixed emotions, Glen retired as an attorney for the U.S. Tax Court in 2012. Photo by Colleen Ricci.